Metallographic etching is a chemical technique used to highlight features of metals at microscopic levels. By studying the character, quantity, and distribution of these different features, metallurgists can predict and explain the physical properties and performance failures of a given sample of metal. Most metallurgical features are microscopic in size; they cannot be seen or analyzed without optical magnification of at least 50x and as much as 1000x when using light microscopes. To analyze such features, a metallic sample must be polished to a very fine mirror-like finish. Unfortunately, under a microscope, such a finely polished surface just looks like a plain white field. To create a contrast between the elements of the metal's microstructure, chemical solutions known as etchants are used. Etchants selectively corrode some of those elements, which show up as darker regions. This is possible because differences in the composition, structure, or phase of a metal alter the relative rates of corrosion when exposed to an etchant. The two most common techniques are chemical and electrochemical etching. Chemical etching is typically a combination of either an acid or base with an oxidizing or reducing agent in a solute such as an alcohol. Electrochemical etching is a combination of chemical etching with an electrical voltage/current." Metallurgists are scientists who specialize in the structure and chemistry of metals. When metals fail (for example, a structure collapses), it's important to understand the reasons. Metallurgists examine samples of the metal to determine the reasons for failure. There are over a dozen different etching solutions made up of components such as ammonia, hydrogen peroxide, and hydrochloric acid. Different solutions are useful for etching different metals. For example, ASTM 30, made up of Ammonia, Hydrogen Peroxide (3%), and DI Water, is used for etching copper. Keller's Etch, which is made up of Distilled water, Nitric acid, Hydrochloric acid, and Hydrofluoric acid, is best for etching aluminum and titanium alloys. 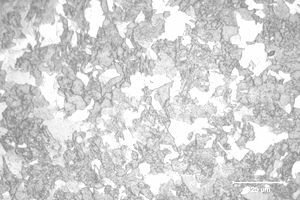 By etching with different chemicals, metallurgists can expose a variety of possible problems in metal samples. Etching can reveal tiny cracks, pores, or inclusions in metal samples. The information provided by etching allows metallurgists to discover why the metal failed. Once a particular problem is identified, it's possible to avoid the same issue in the future.